As a virtuoso of progressive rock music, Mirko Pirozzi is a phenomenal multi-instrumentalist with an inviting sound that will have you thirsting for more. Pirozzi’s music possesses a free-spiritedness not seen since the psychedelic era of the 1960’s. Yet, the sophistication of his musicality is recognized as a vehicle of innovation in this post-modern era. Pirozzi’s newest release entitled Last Eclipse is an ongoing testimony of his harmonic genius. Comprised of ten tantalizing tracks, Last Eclipse is an incredible album that listeners will find rewarding. Based out of Aversa, Italy, Pirozzi’s masterful skill is expressed through his affinity with the piano, synthesizer, guitar, and bass, making Last Eclipse a journey that can easily be enjoyed. The album opens up with the title track Last Eclipse, which proves to be an organic attunement to Pirozzi’s soulful rock extravaganza. The language of echoing guitar and superior drumming take precedence on this melody. The succeeding songs seem to develop an ongoing blissful conversation of the ages. For example, Kaleidoscopic Alien and Days Gone are reminiscent of Jimi Hendrix guitar lingo. When analyzing the depth of Last Eclipse we find an assortment of genres in the album’s unfolding soundscapes, which is clearly evident on the jazz-influenced Mosaik. The album concludes with a festive-screaming funky tune called Planets. 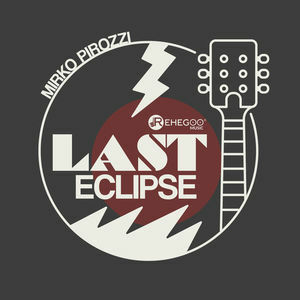 Last Eclipse by Mirko Pirozzi is a masterpiece and deserves a space on the shelf of every music enthusiast and rock purist in the world. I cannot emphasize enough the measurement of artistry that this album contains, whose fullest appreciation can only be adorned by those looking into the heavenly direction of the Last Eclipse.